What was your favorite kind of potato chips as a kid? 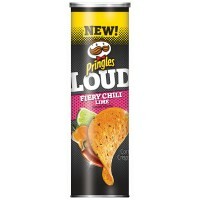 Pringles all new Loud Fiery Chili Lime is a childhood favorite with a grown up "twist". This popular American snack now comes with the hot & spicy taste of chilis and tangy lime. Fiery Chili Lime Pringles are bold, loud, and tasty. Each container has 5.4 oz. of crispy, yummy Pringles inside. Degerminated yellow corn flour, vegetable oils (corn, cottonseed oil, soybean oil, and/or sunflower oil), grain and vegetable blend (dried carrots, modified rice starch, malted barley flour, oat flour, dried spinach, dried peas, wheat starch), dried potatoes, maltodextrin, rice flour, corn starch, sugar, emulsifier E471, 2% or less of: salt, whey, cheddar cheese (milk, salt, cultures, enzymes), onion powder, parmesan cheese (milk, salt, cultures, enzymes), acidity regulators E330-E270, natural flavors, yeast extract, lime juice solids, olive oil. Contains GMO. Nutrition facts (for 100g): calories 500Kcal, total fat 28.6g (saturated fat 7.1g), total carbohydrate 60.7g (sugar 3.6g), protein 7.1g, salt 2.3g.